Italy is so abundantly endowed with remains of classical antiquity that we tend to overlook the even older bits of ancient Italy. There are many that we really don't know much about. If you go back to about 700 BC, you find an Italian peninsula not yet characterized by strong Italic tribes, although you certainly find early versions of Latini, Campanians, Oscans, Sabines, Volscians, and so forth, among whom the Latini did famously well for themselves. And, importantly, you find a large and strong Etruscan presence spread from north to south even as far as the southern portion of present-day Campania, at which point it runs into remnants of early prehistoric peoples, and smatterings of Greeks immigrant settlers and traders. (That relatively small Greek presence started around 800 BC but by 600 had expanded greatly and established many of the well-known settlements of Magna Grecia in Italy.). It is during this period, the first half of the 7th century BC (from 700 to 650), that someone built a settlement with impressively large walls (termed "Cyclopean"*) on the hill upon which perches the town of Atena Lucana, a town with a claim to being the oldest settlement in the area. The most interesting thing about that claim is that archaeologists see the site as having been some sort of communication hub between quite different cultures. Atena Lucana is technically not part of the Cilento and Vallo di Diano National Park, although it is close enough to be included as one the towns associated with that park. I have not yet had the chance to wander through the small archaeological museum in Atena Lucana; I will do so at the first opportunity and report back; sight unseen, I know that it will be well done and that they will need a lot more money. Atena Lucana is 115 km/70 miles SE of Naples and 50 km/30 miles inland (due east) from Paestum. 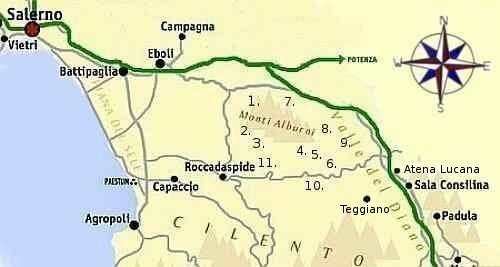 It is on the other side of the Alburni massif (map, just above Sala Consilina), strategically placed at about 650 meters on a hill overlooking the Tanagro river and guarding the ancient approaches to the Diano Plain (Vallo di Diano), the long, narrow passage to southern Italy. Just east of the town and the river, the Maddalena mountains start their climb and form the boundary between the modern regions of Campania and Basilicata. There are not a lot of ancient written sources on the origins of Atena Lucana. Roman sources mention Atina or Campus Atinas, and Pliny the Elder calls the inhabitants 'Atinates' and lists them as one of the Lucanian peoples. Whether or not the original name corresponded to "Athens," purportedly so named by Greeks settlers, is debatable, and most sources claim that the name, in fact, does not mean "Lucanian Athens," as pleasant and poetic as that might sound. It is not at all clear who built the walls and I haven't found any unanimity of opinion on that subject. Some sources say it is an early Greek settlement, which would be strange since the Greeks built along the coasts of Italy and Atena Lucana is well inland. It might have been the earlier Lucanians, settlers from farther north and a descendant culture of the Samnites. The Lucanians had settlements both along the southern coasts (the Tyrrhenian as well as the Ionian) and inland. 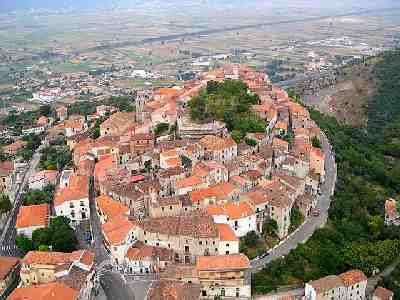 Indeed, Atena Lucana was one of the principal cities in the so-called Lucanian Federation. They were displaced from the coast by the Greeks, but later returned and spent a few centuries contesting the whole area with the Greeks until the Romans took it all over (roughly between 300 and 200 BC). One intriguing theory says that the walls were the work of inhabitants before the Greeks and Lucanians. There were indeed earlier peoples to whom we have given names in our histories of the ancient world, such as the Enotrians, who inhabited the Ionian and Tyrrhenian coasts and were in southern Italy possibly as early as the middle of the second millennium BC, well before even the Etruscans. The Greeks of Magna Grecia regarded them almost mythically, holding them to be descended from the ancient pastoral people of Arcadia, the mythical home of Pan. That would put them way back among the "Pelasgians," a catch-all term used by early Greeks histories to describe the people who were in Greece even before the Greeks. A connection to that degree of antiquity in the walls of Atena Lucana is hard to substantiate. Tempting, yes. In any event, the peoples of pre-Roman Italy were many, and only the few and famous such as the Greeks and Etruscans have left substantial pieces lying around on the ground (or below it) to help us figure out who lived when and where. Some others, such as the Samnites, Lucanians and, as noted, the Sardinians and great wall builders of central Italy have also left large fragments. All we can say with a degree of certainty is that there were, indeed, prehistoric peoples on the peninsula who were largely overwhelmed by Indo-European tribes beginning in the second millennium BC who, following Pareti (bibliography), are termed "first Italics" and "second Italics," depending on when they arrived and from which direction — north to south or from east to west across the Adriatic or Ionian seas. These include all the well- and lesser known cultures in Italy bonded linguistically by languages related to a presumed parent tongue of Latin. Pareti excludes the non-Indo-European Etruscans from this grouping. Whether any of these people built the original settlement at Atena Lucana is still a mystery, at least to me. The first real archaeology at Atena Lucana was at the end of the 1800s and beginnings of the 1900s with the emphasis on the wall around the city, the perimeter of which had only recently been sketched out. Most of the evidence was (and still is) unfortunately covered by centuries of subsequent layers, including the nucleus of the modern town. The wall is the oldest evidence of human habitation at Atena Lucana. As well, tombs from the 6th and 5th centuries B.C. were found, as well as later Roman ruins. In 1925 construction of an aqueduct brought to light remains of ceramics, statuary and an assortment of funerary ornaments. The 1960s saw a rebirth in archaeological interest in Atena Lucana on the part of the Provincial Museum of Salerno at which time bronze weapons and bowls were uncovered. Research continues at the present time. As might be expected, Roman ruins in the area are easier to find, but emphasis is on the evidence in the hundreds of necropoli, for example, that might shed more light on truly "ancient" inhabitants and the role that the site may have played as a presumed way-station on the way to cultures farther south in Italy. -Lo Schiavo, F. (1984) "Central and Southern Italy in the Late Bronze Age," in Crossroads of the Mediterranean, T. Hackens, N. Holloway, R. Holloway (eds), pp. 55-122. -Tardugno, Maria Luisa (2010) L'area "Nord-Lucana" ed il sito di Atena Lucana: identità e caratteri di un gruppo indigeno ai margini del Vallo di Diano. [The North-Lucana area and the site at Atena Lucana: identity and character of an indigenous group on the fringes of the Diano Plain] Doctoral thesis, Frederick II U. of Naples. -Torelli, Mario. (1977) Greci e indigeni in Magna Grecia: Ideologia religiosa e rapporti di classe. [Greek and indigenous peoples in Magna Grecia and relationships among classes] Studi Storici, year 18, n. 4, (Oct. - Dec.) Pub. by Fondazione Istituto Gramsci, Rome.